Not pictured are a few weekends that Andrew spent repairing some rotten boards in the floor on the Northeast corner of the garage and the time spent clearing the rest of the junk out of the garage. Over the holidays at the end of December, Andrew got a lot of work done. He sealed up the old garage door (for human bodies) that was to the right of the window, and resided (with our old siding) the South side of the playroom (where the garage door used to be). Next step, framing the floor. This happened at the end of December, over the New Year's holiday and Andrew's dad came up to help him. It's a floating frame, resting on insulation board. It's pretty genius, works amazing, and was (relatively) easy. Thanks Jack for the idea! On the South end of the room, looking at the West corner. Looking at the door, in the Northeast corner. 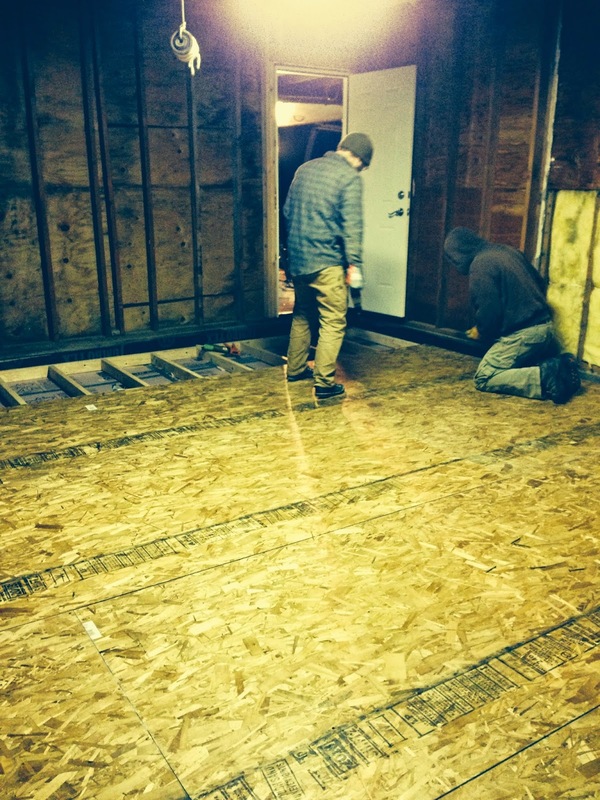 One last big step in this stretch, on the 3rd Taylor came over and helped Andrew finish laying the sub flooring. Starting to look more and more like a room!